Friends, former employees, and fellow lovers of all things electronic, we are gathered here today to remember and honor our lifelong friend and enabler of our hobby and passion, Radio Shack - once a Tandy company, as we are familiar with it. 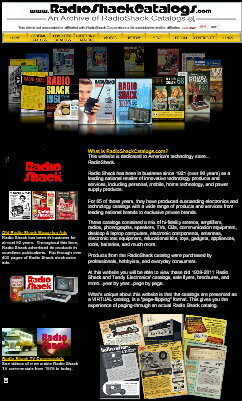 Radio Shack has lingered in failing health for a decade, all the time keeping a brave face on its dwindling number of stores. Caretakers attempted a variety of infusions and transplants in an attempt to save the American stalwart electronics retailer. Alas, a confluence of poor management, an inability to compete with foreign entities, and a planet-wide usurpation of consumer business by Internet venues (the latter of which are symptoms of the former) caused its untimely death. In 2015, Radio Shack filed for bankruptcy and everyone thought for sure it was a death knell, but fortunately investment firm General Wireless Operations, Inc., stepped up and bought its assets and brand name, which would be shared with Sprint outlet stores. Evidently, even they were not able to resuscitate the comatose body since in March of this year Chapter 11 bankruptcy was filed once again. Here is a long list of actions filed with court clerk dockets regarding Radio Shack bankruptcy, beginning March 26, 2015 and running through today. 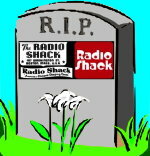 I for one - and I may be the only one - rue the loss of Radio Shack. It has been a staple on the American landscape for my entire life. Like Montgomery Ward and now Sears & Roebuck (which recently closed here in Erie, Penn. ), many of the retail corporations that built this great country are disappearing, never to return. Walks through or local mall are not the same. Time marches on, trends and expectations change, and nostalgic old fogies like me are dragged along, kicking and screaming, into the future. It's not that I don't welcome and embrace new technology, it's just that I hate to see reminders of earlier times spent with family and friends who have passed on go away.